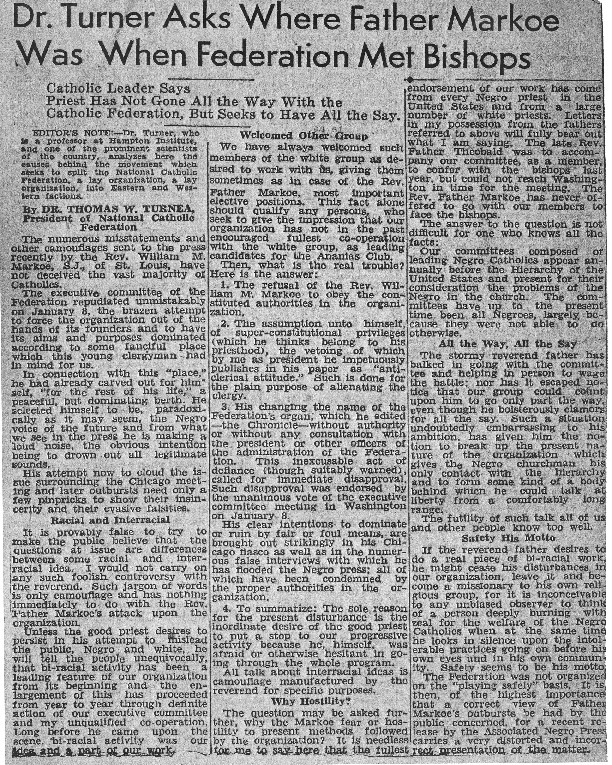 A few months after a similar draft was written by Turner, an editorial on Father Markoe's actions appeared in The Afro-American. In this article Turner accused Markoe of usurping the leadership of the Federation, acting and speaking hypocritically, and causing division within the Federation. What is the general tone of the editorial? Please provide specific excerpts to support your statements. How does Turner respond to the claim that Father Markoe's new organization offers interracial solutions to existing racial problems? What does Turner think is Father Markoe's true motivation in ousting him from the presidency of the FCC? Compare this article to document seven. What are the reasons given in each for changing the title of the magazine? Is it your impression that either Father Markoe or Turner is lying about their intentions? What other possible explanation is there for their divergent perspectives?